It's a question that every couple gets: "So how did you two meet?" 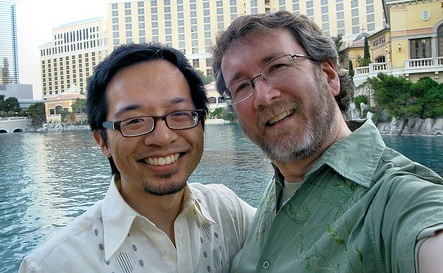 Thom Watson and Jeff Tabaco have an answer that's pretty common these days – they met on the internet. But their story has a twist – they found each other not through an on online dating site, but thanks to their personal blogs. Eight years ago they both lived in Washington, DC and started commenting on each other's sites. The blogs featured their thoughts on everything from world events to books and movies. "Neither of us was looking for love," says Jeff. "It sort of happened very naturally." Looking back, it was actually a great way to get to know someone. "After a while we decided that we liked what we were reading and so we wanted to meet in person," says Thom. So their first meeting wasn't supposed to be a date, but it turned out to be like one. "Jeff can be shy, and that first night he was pretty quiet. I went home thinking, 'This was not a success,'" says Thom. "I thought, 'We’ve chatted so much online, but this guy didn’t really like me.'" Jeff saw it another way. "It was kind of funny, because on my end I was like, 'Wow he’s asking me a lot of questions, he’s talking to me,'" says Jeff. "So I thought, 'Cool, this might go somewhere.'" Luckily, they did see each other again, and the relationship took off. "I guess it is that truism that when you’re least expecting it, it kind of hits you over the head," says Thom. The couple later packed and headed to California, actually moving into the house where Jeff grew up near San Francisco. After a few more years, they realized they wanted to take the next step – but Proposition 8 meant they couldn't get married in the state. "It came out of a number of years of mutual love and respect, and deciding that we wanted to solemnize that," says Thom. Jeff adds, "This is the one of the most personal days of our lives, and we wanted to express that in front of our family and friends in a way they might not see otherwise." "Especially among our family, like say among our mothers, the whole 'partnership' thing was kind of abstract – you know, 'What does that mean?'" says Jeff. "But when there’s a wedding, it's in cultural language that they understand." They decided they would have a commitment ceremony – but not travel to a state where they could get married legally. "It's a part of me – the Californian in me wants it here in my home state," says Jeff. "I don’t want to have to go somewhere else, where I don’t live, to have a legal marriage." The result of a ceremony not recognized in California was a mix of good and bad. On the positive side, it was a beautiful cliff-side event that brought their two families closer together. Their mothers met for the first time a few days beforehand. "They’ve become fast friends, and that’s been really wonderful to see," says Thom. "They really do think of both of us as sons, and of the two of them as in-laws." But there was a downside. "Only my mom and my nephew came out for the ceremony, and I think that if we had actually had a legal wedding, more of my family would have understood and would have come," says Thom. "I mean, my family, my cousins all are very supportive – but I think that to them, it just didn’t register as important in the same way that a wedding would have. And that’s another reason that those words are so important." So Thom and Jeff keep living like a married couple – even if technically they're not. "We’re just two guys who live down the street with their two cats, who love each other, who take care of each other when one is sick or hurting, who laugh with each other," says Thom. But they look forward to the day when they can have the recognition they feel they deserve. "As the son of immigrants, I grew up very aware of the search for a better life," says Jeff. "My parents left the Philippines knowing there would be difficult changes ahead, but that their lives could change for the better. My mother’s favorite saying is, 'As I breathe, I hope.'" You can see the blogs that started it all at jefftabaco.com and thomwatson.com, and check out the site from their commitment ceremony at thomandjeff.com.